Jakarta – The Nusa Indah shop in Jakarta is chock-a-block with shoppers during lunchtime. It sells delicacies from all over Indonesia to customers trying to follow an old – but to many young people, annoying – Indonesian tradition. 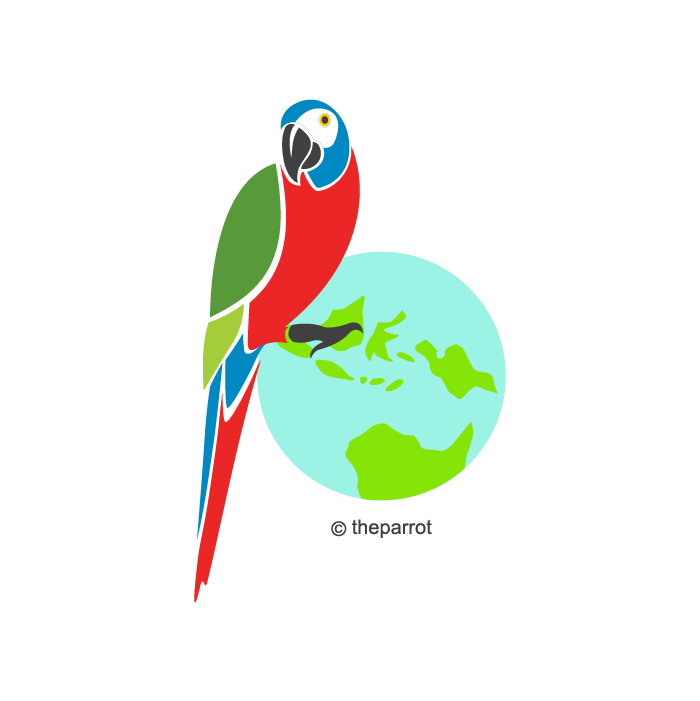 They buy sambal rudi, a chili paste from Surabaya, or bakpia, a cake from Yogyakarta, and present them to friends and family as gifts from their travels. That is to satisfy the demands for oleh-oleh, a gift-giving tradition that is quintessentially Indonesian. “Where is my oleh-oleh?” is a familiar line every Indonesian has heard when returning from a trip, be it domestic, international or even a religious pilgrimage. Indriati Octarina, a mother of three who lives in Jakarta, thinks it is okay to ask friends or relatives for gifts from their trips. Lemper- steamed sticky rice filled with shredded chicken wrapped in banana leaf- is one of the many famous dish from Indonesia. “It makes me feel happy to know that people still remember us while they are travelling,” she says. But some travellers are weary of it. “A friend in Jakarta pushed me to buy her a bag when I was in Singapore, although I told her my money was very limited. She asked me to use my credit card and said she would pay me back later,” Jakarta dentist Erni Pujianti says. “Some senior colleagues in my office would asked me to bring up to 10 kilograms of fresh shrimp or crab when I travel to the eastern part of Indonesia, giving me a headache,” says Purwanti, an engineer who often travels throughout the vast archipelago. “They don’t care if I have to pay for extra baggage, and I just couldn’t say no,” she says. The oleh-oleh custom goes back to when travelling was considered a rich person’s hobby. In earlier days, those who could afford to travel, especially overseas, were perceived as wealthy; they could share some of their fortune by bringing back gifts. But the emergence of low-cost airlines over the past decade has changed the picture. Most people can afford to travel now, but do not necessarily have enough money to buy gifts. “I finally said enough! I am not travelling to bring back oleh-oleh,” Makki says he told friends and family. But the demands keep coming, especially because he often travels to exotic destinations like Iran, Nepal or Sri Lanka. “I told them if they will pay, I will bring them items they want,” he says. While travelling, he posts photos of items suitable as oleh-oleh on Facebook, with the prices. Whoever is interested, will have to pay. Shops like Nusa Indah provide an even more convenient way around the oleh-oleh tradition. 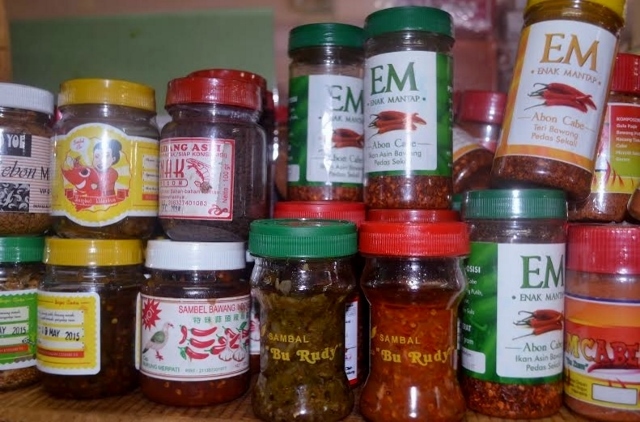 All kinds of sambal, or chilli paste from Indonesia in Nusa Indah shop. “We have customers who are too busy to get oleh-oleh when they travel, so they buy it here,” owner Ibu Hartati explains. Crowds in her shop are ever growing. Nearly buried under a pile of snacks on her simple counter, she prepares customer bills with her old calculator and accepts cash only. 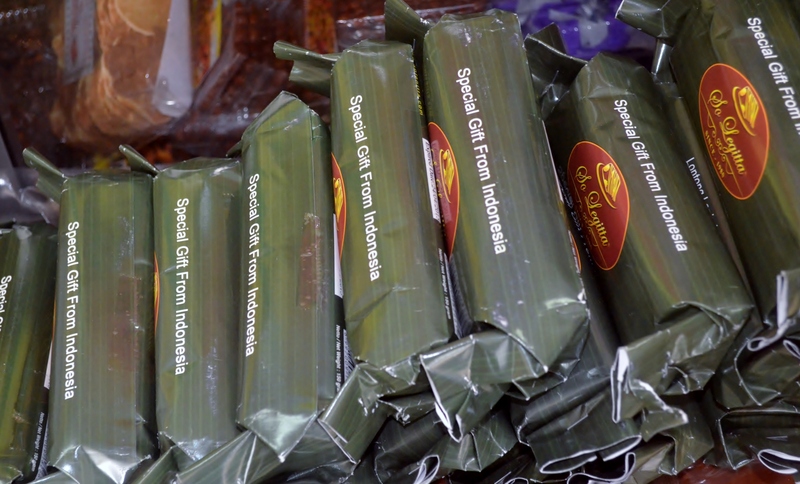 “We were too busy during our trip to central and East Java to buy oleh-oleh. But it would be awkward not to bring some gifts to family and friends, so this place is the answer,” Ahmad Zulkarnain says as he purchases layer cakes and crackers with his wife Yulianti. “When I went on the pilgrimage, I bought all the oleh-oleh in Tanah Abang, because I wanted to focus on my worship during hajj and not be burdened by buying gifts,” confesses Rahayuningsih, a 60-year-old housewife in Jakarta. “I gave the gifts I bought in Tanah Abang to friends and relatives, and they couldn’t tell the difference,” she says, giggling. She saved time, but not money, she said. The gifts she bought were lavish.